The Indiana Prosecuting Attorneys Council Wednesday delivered a firm warning to state lawmakers about marijuana legalization. Leaders of the council say they’ll fight any legislation to legalize marijuana in the state, whether it’s for recreational or medical use. 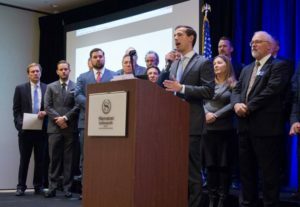 They levied a slew of arguments against legalization – that it functions as a gateway drug for young people, that it leads to increased traffic fatalities, and that a lack of regulation around the industry has created dangerous, unstable markets in states like Colorado. And Executive Director David Powell says there isn’t enough evidence marijuana has a positive impact on any medical needs. “So if there’s research out there that says it’s OK to smoke pot and it’s healthy, and it’s good for you, I’d like to see it. That’s real research, and not anecdotal, or an opinion, or a survey of marijuana smokers,” Powell says. Attorneys were joined at the event by supporters including Mike Ripley of the Indiana Chamber of Commerce, Sheriff Mike Nielsen of Boone County and, by video, Indiana Attorney General Curtis Hill. Marijuana legalization advocates have pushed in recent weeks for loosened restrictions on medical marijuana. That effort includes the American Legion.